WP Remote re-designs, launches new premium features and introduces a powerful public API. A new Premium plan with several much requested features. A re-design with a focus on speed & simplicity. The public release of our powerful API. WP Remote has always been about taking the pain out of managing all of your WordPress sites. We’re proud to say we are now helping our users manage more than 45,000 sites. In the last month alone WP Remote has updated 40,000 Plugins, performed over 6,000 WordPress Core updates and backup over 350 GB. Pretty amazing! We built WP Remote to satisfy our own need for a more efficient way to manage a lot of WordPress sites. At Human Made we visit WP Remote several times per day to maintain both our own sites and the sites that our clients pay us to manage. To be useful to us WP Remote has to be simple, fast and effective. Automatic backups stored on WP Remote (previously this was a separate $5 per month per site cost, now it’s part of Premium). Automatic backups to your own Amazon S3 or Dropbox account (with more destinations coming soon). Fully automatic Core, Theme, and Plugin updates. A daily email summary of what has been happening on your sites. The ability to install, activate, deactivate and delete Themes & Plugins. 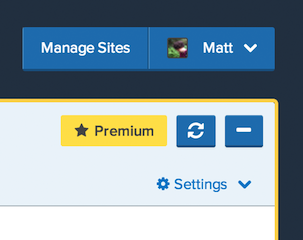 History will now log important actions that happen on your site (for example if you switch theme, an administrator user changes their password, etc.). We’re introducing the new Premium plans at discounted prices of $24 per month for 5 sites, $39 per month for 10 sites and $149 per month for 50 sites. In addition to your Premium Sites you can continue to add an unlimited number of Free Sites. Read more about these exciting new features on the homepage or in our documentation or log-in/sign-up and upgrade now! We now have a comprehensive JSON API that gives you access to all of the functionality we currently expose through the WP Remote Web App (and some functionality not currently exposed in the UI). This API is the future of WP Remote. We’ve built the WP Remote Web App 100% on-top of the publicly available API, we have no hidden/private end-points. This full separation of the functional core and the Web App UI is a powerful step towards allowing multiple different clients, whether they be first party clients we develop in the future or 3rd party clients developed by others in the community. It will also make it possible to deeply integrate WP Remote into your existing workflow. Dive into our documentation to get started. As an example check out our very own WP Remote CLI tool, inspired by WP CLI. it allows you to interact with your remote sites via the command-line, especially useful in situations where you don’t have SSH access to your site.